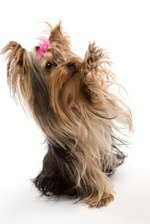 A little Yorkshire terrier has the pet obsessed scratching their heads after her owner, 18-year-old Lexus Perez, shared a series of videos to Twitter showing the dog snubbing tasty treats like peanut butter and, instead, opting for healthy vegetable noms. The Yorki — a rescue adorably named Bambi — shocked everyone by first choosing lettuce over bacon. "Guys wtf is wrong with my dog, what dog chooses lettuce over bacon?!!! 😂 😭"
Bami's indifference continues to baffle after she picks a carrot instead of peanut butter. "Pt. 2 Peanut Butter Vs A Carrot 😂"
Unlike cats, who are obligate carnivores, dogs can have lots of vegetables in their diets. In fact, vegan and vegetarian diets can be quite healthy for dogs, especially those who have packed on a few pounds. Visit our health section for helpful nutritional guides for your pup!